Newspaper article organizer and framework. 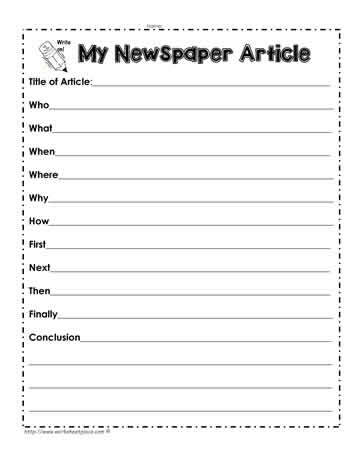 Free newspaper graphic organizer. When working with media studies, learners will much more readily be able to write a newsy article when given a graphic to write. Graphic organizers support young learners with their writing. Sometimes, you'll want to provide prompts like 'Buried Treasure Found in the School Yard', 'Youngest Principal Ever, Secures Job at Big School', or 'Student Finds Winning Lottery Ticket on Yard'. When prompts are provided, students have an idea to get started. Doing this activity with the whole class is a great starter activity when teaching about writing news articles.